Equal parts form and function, just add water. 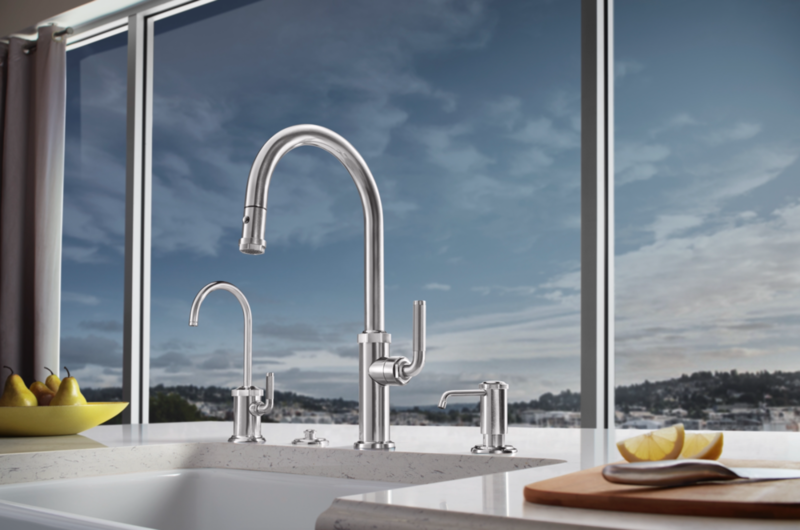 Huntington Beach-based firm California Faucets has introduced a versatile new series to their kitchen collections. Called Descanso, the line centers on a magnetically docking, pull-down faucet that melds industrial details and sleek styling for a supremely functional fixture. Hash mark-textured knurling on the handles reference power tools and also improves grip. There are customizable options, too: Choose the black carbon fiber detailing (the same material used in building Formula 1 race cars and racing bicycles) for an edgier statement, or opt for the smooth handles that create a more minimalist look. 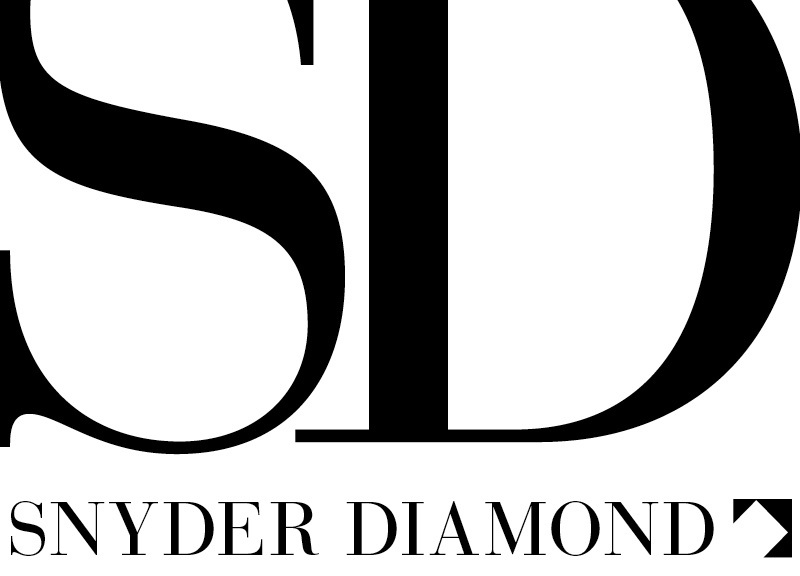 Coordinating accessories include a pull-down prep/bar faucet, hot and cold water dispensers, a pot filler, a soap dispenser, and air-activation switch and gaps for the disposer. Descanso also has a companion line for bathrooms. Like all of California Faucets solid-brass designs, the line is available in 30-plus artisan finishes, guaranteed not to tarnish. Graff kicks the traditional silhouette of a bridge faucet up a notch with the clean, curvilinear lines of Sospiro. And they’ve also cleverly adapted the design to bar/prep sinks, falling right in line with the reemerging trend in home design for custom cocktail and coffee bars. 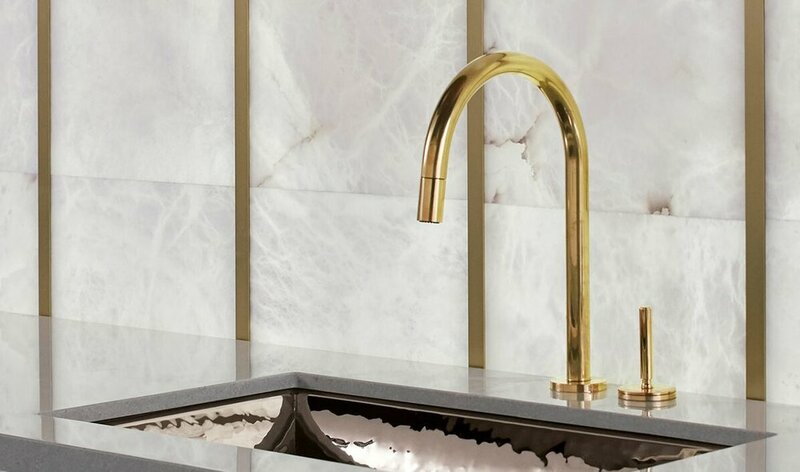 Taking on a narrower form than its sister version, the Sospiro bar fixture packs all the power of a kitchen faucet, thanks to its pull-down design. Choose from four finishes: polished chrome, brushed nickel, polished nickel and olive bronze. Infusing minimalistic design with classic character, the One collection by Kallista is designed for individuals who appreciate simplicity in design. Each piece in this elegant collection has a soft, sleek form that pairs perfectly with an array of contemporary environments. Available standard in an array of finishes including unlacquered brass and gunmetal, users have the freedom to choose pieces that cater to their discerning tastes. 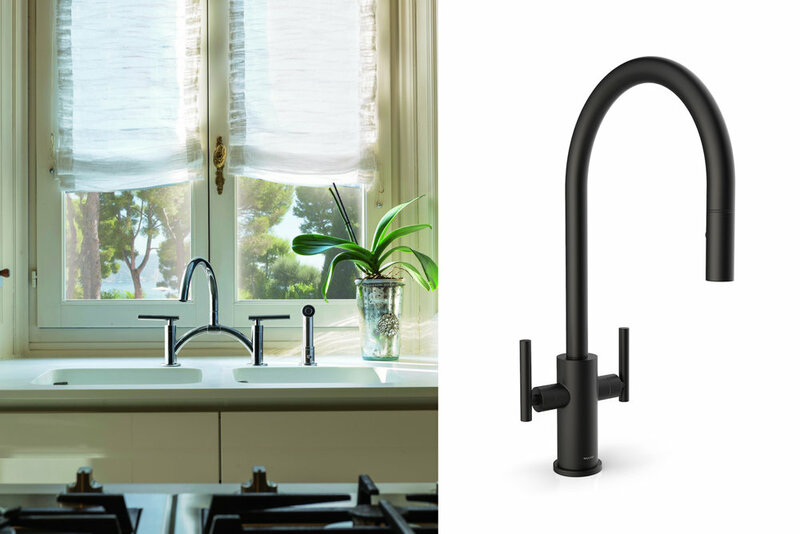 Embracing the art of simplicity with its sleek form and balanced design, the One pull-down kitchen faucet will add a touch of sophistication to any space.